Local search results are key to storefront businesses and service businesses who rely on customers to find them on their phones and laptops. Our client, Mobile Mower Repair, has a retail business location where they sell lawn and power equipment but their primary business has always been on site lawn mower and snow blower repairs. 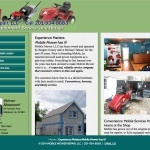 Competition is tough in northern NJ and there are a lot of companies vying for the same customers, but because Mobile Mower Repair has always maintained a Google Plus local page, they get lots of exposure in Google search for popular search terms like “lawnmower repair” and “used lawn mowers”.